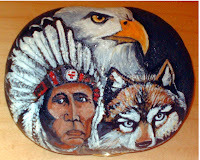 Large, hand painted rock depicting an indian, eagle and wolf. 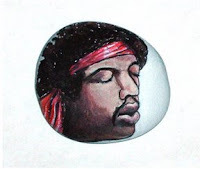 This detailed painting measures 5" x 6" (4 1/2 lbs.) and is sealed with a protective finish for lasting durability. Gold stand is included. Harp Seal 1 1/2" X 3 "
2 Hidden monsters , Pebble Pets approximately 1 1/2" each. ALL PRICES INCLUDE SHIPPING CHARGES. ORDERING INFORMATION:Please email me HERE if interested in purchasing any of the items on this site. SATISFACTION GUARANTEED Your order is covered by our full 15 day money back guarantee. If you are not absolutely delighted and satisfied with your order, notify me upon receipt and promptly return WITHIN 15 DAYS for a full refund of the purchase price INCLUDING YOUR INITIAL shipping costs. NO QUESTIONS ASKED!